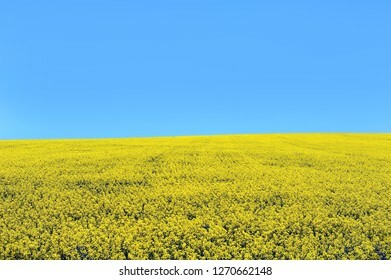 1,081 stock photos, vectors, and illustrations are available royalty-free. 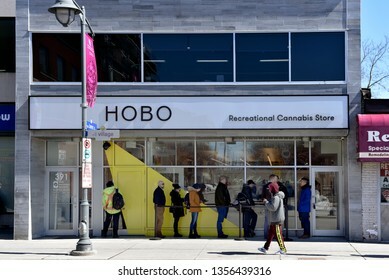 Ottawa, Canada - April 1, 2019: Customers wait in line to enter the Hobo Recreational Cannabis store on Bank St the first day for legal retail store sale of cannabis in Ontario. 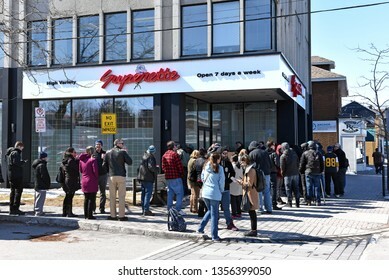 Ottawa, Canada - April 1, 2019: Customers wait in line to enter the mariuana dispensary on the first day for legal retail store sale of cannabis in Ontario. 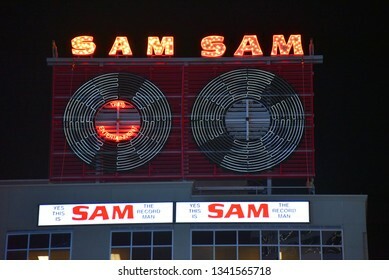 Toronto, Canada - March 6, 2019: The iconic neon sign from the Sam The Record Man store on Yonge Street. 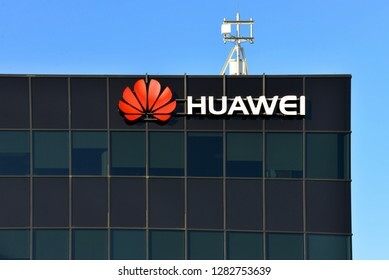 The store closed in 2007 and the sign was remounted on a nearby building in 2018. 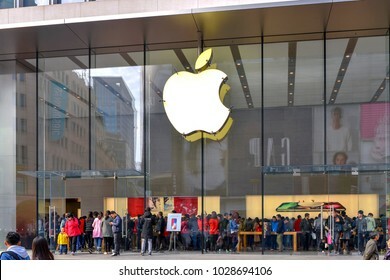 Shanghai, China - November 19, 2017: A large crowd of people shopping at the Apple store on Nanjing East Road, a very busy shopping district. 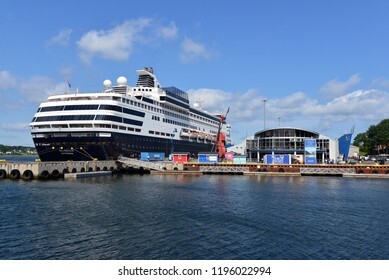 Sydney, Nova Scotia, Canada - August 8, 2018: The Holland America Massdam docked near the Joan Harriss Cruise Pavilion, and the world's largest fiddle in Sydney, Cape Breton, Nova Scotia. 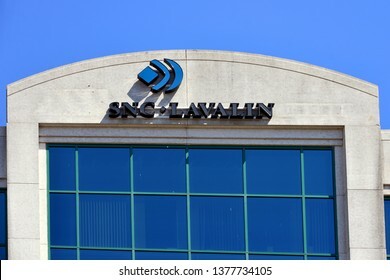 Ottawa, Canada - April 22, 2019: SNC Lavalin a Quebec based engineering, and construction company that is currently involved in a scandal that has hurt Canadian PM Justin Trudeau in the polls. 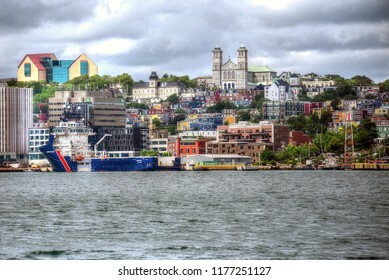 St. John's, NL, Canada - August 10, 2018: Downtown St. John's featuring the Basilica of St. John the Baptist and the colorful row houses the city is known for. 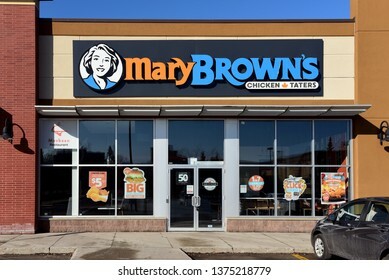 Ottawa, Canada - April 13, 2019: Mary Brown’s Chicken & Taters on Carling Drive. 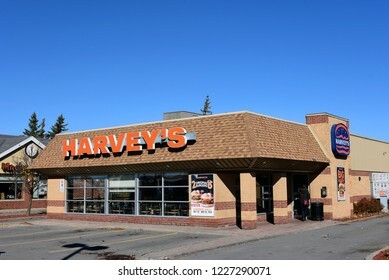 The fast food franchise originated in St. John’s Newfoundland in 1969 and now has over 140 locations in Canada. 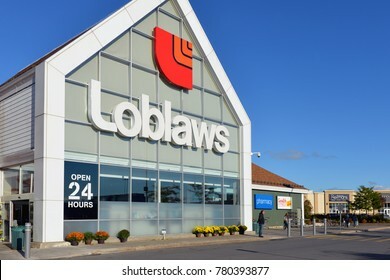 Ottawa, Canada - September 14, 2014: Loblaws at College Square on Woodroffe Ave. Loblaws is a grocery supermarket chain from Ontario with over 2000 stores in Canada. 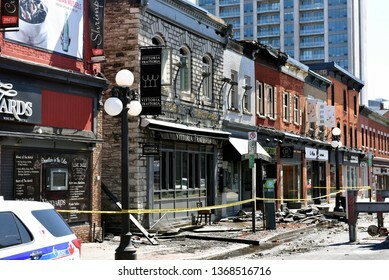 Ottawa, Canada - April 13, 2019: William Street in the Byward Market still closed after Vittoria Trattoria caught on fire and spread to other heritage buildings the day before. 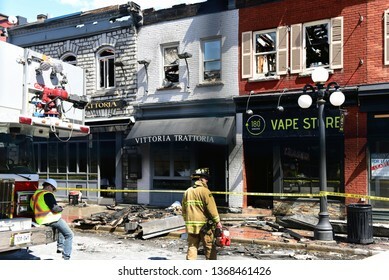 Ottawa, Canada - Apr 13, 2019: Firemen outside restaurant Vittoria Trattoria and adjacent shops which were severely damaged by fire the day before. 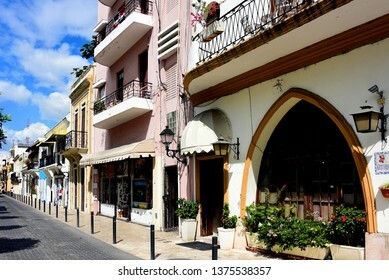 Many of the shops on William St remained closed. 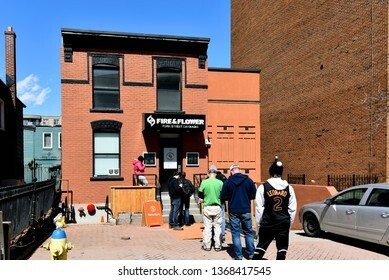 Ottawa, Canada - April 13, 2019: Customers wait in line to enter the Fire & Flower Cannabis store on York St. 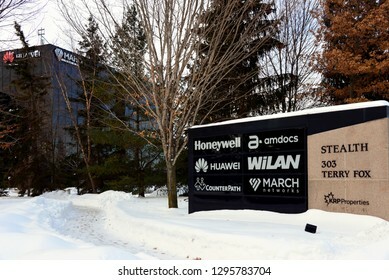 The store opened April 1 the first day for legal retail store sales in Ontario. 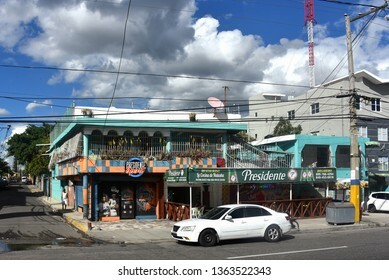 Santo Domingo, Dominican Republic - February 7, 2019: Restaurant La Cocina de Natasha in Santo Domingo Este featuring signage for the popular Dominican beer Presidente beer. 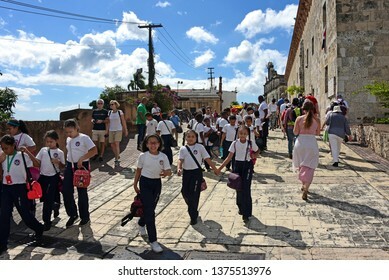 Santo Domingo, Dominican Republic - Feb 7, 2019: Tourists visiting the historic Colonial Zone of Santo Domingo whick is the oldest permanent European settlement of the Americas. 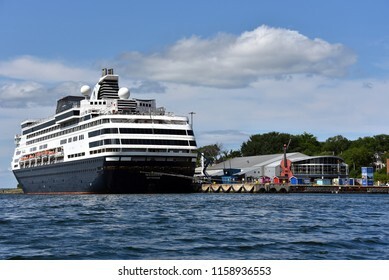 Sydney, Canada - August 8, 2018: The Holland America Massdam docked near the Joan Harris Cruise Pavilion, and the world's largest fiddle in Sydney, Cape Breton, Nova Scotia. 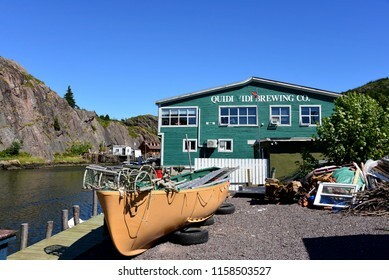 St. John's, NL, Canada - August 11, 2018: Craft brewer Quidi Vidi Brewing Company is the third largest brewer in the province of Newfoundland and Labrador. 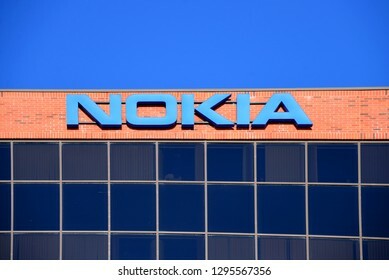 Named after the quaint neighbourhood. 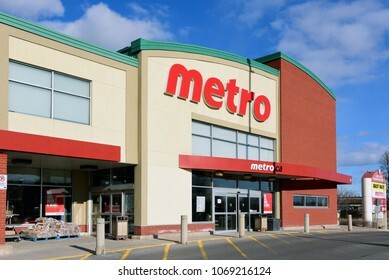 Ottawa, Canada - April 8, 2018: Metro Grocery store on Merivale Road. 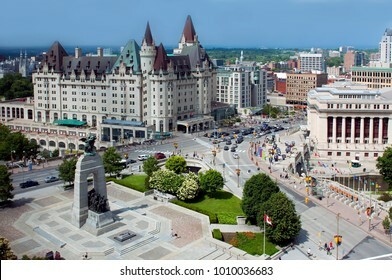 Metro is Canadaâ? 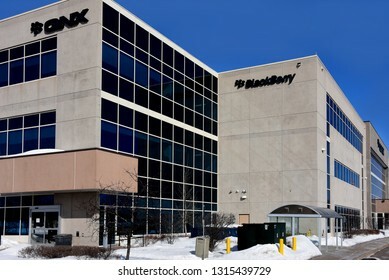 ?s third largest grocer and is headquartered in Montreal, Quebec. 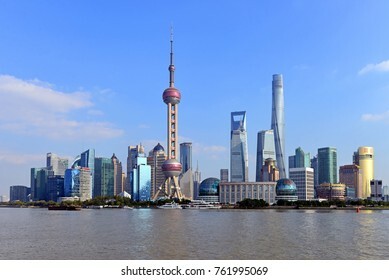 SHANGHAI, CHINA - NOV 1, 2017: The magnificent skyline of the Pudong area of Shanghai on a sunny day, as seen from The Bund, across the Huangpu River. 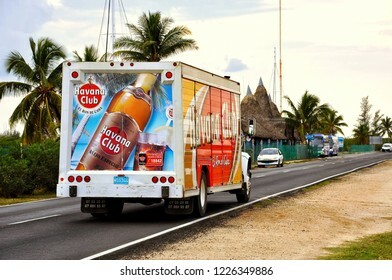 Veradero, Cuba - February 1, 2010: Havana Club rum truck drives through the main highway to supply the resorts in the area. 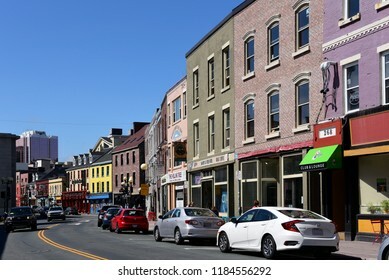 St. John's, NL, Canada - August 12, 2018: A row of colourful shops on Duckworth Street. 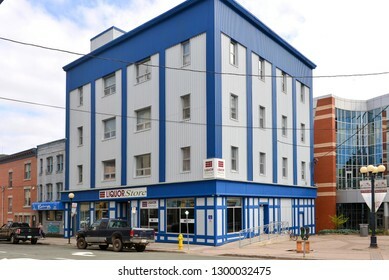 St. John's is the oldest city in North America, and many of the buildings are appreciated for their history. 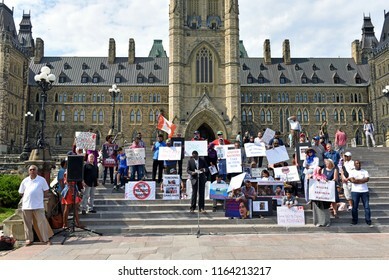 Ottawa, Canada - August 25, 2018: A crowd gathers on Parliament Hill to mark and protest the one year anniversary of the Myanmar crackdown on its Rohingya population. 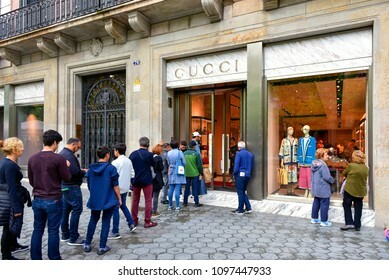 Barcelona, Spain - May 5, 2018: People wait in line to enter the Gucci, the Italian luxury brand store on Passeig de Gràcia. 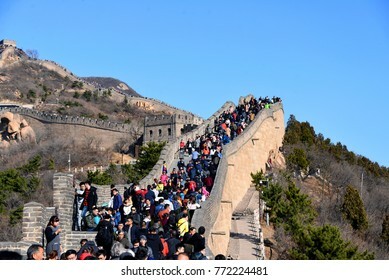 BEIJING, CHINA - NOVEMBER 11, 2017: A large crowd of people visit the world famous Great Wall of China on a sunny day. 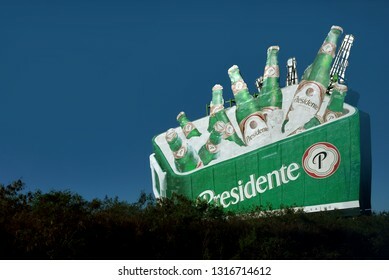 Punta Cana, Dominican Republic - February 7, 2019: Billboard for Presidente the popular beer brewed in the Dominican Republic and exported to several other countries. 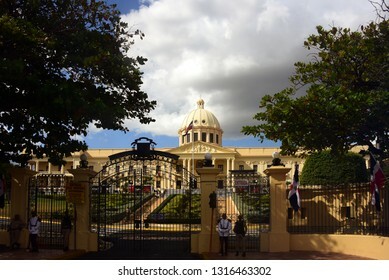 Santo Domingo, Dominican Republic - February 7, 2019: The National Palace which houses the offices of the Executive Branch (President and Vice President) of the Dominican Republic. 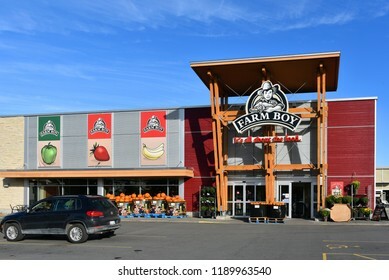 Dartmouth, NS, Canada - July 31, 2017: Sobeys grocery store on Tacoma Drive. 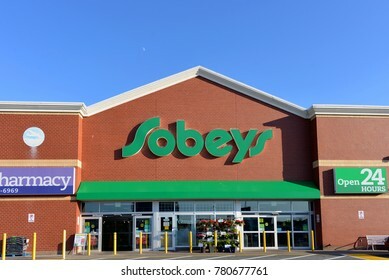 Sobeys is the second largest food retailer and operates, under various, banners across Canada. 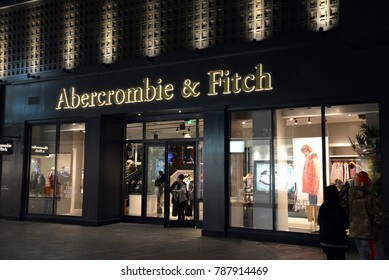 Beijing, China - November 11, 2017: People shop at night at the Abercrombie & Fitch, an American retailer, in the Sanlitun district known for its international chain stores. 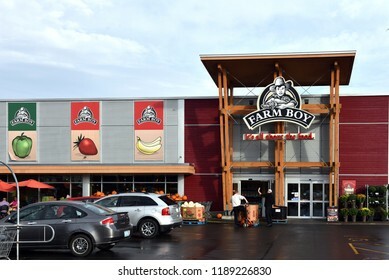 Ottawa, Canada - September 27, 2018: Ottawa based food retailer Farm Boy and its 26 locations were recently purchased by Empire Co. Ltd., parent of the Sobeys, another Canadian grocery chain. 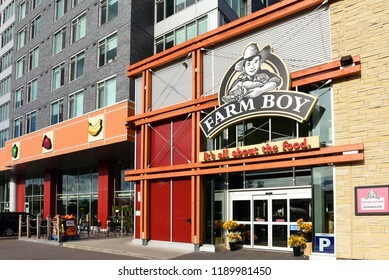 Ottawa, Canada - September 26, 2018: Ottawa based food retailer Farm Boy and its 26 locations were recently purchased by Empire Co. Ltd., parent of the Sobeys, another Canadian grocery chain. 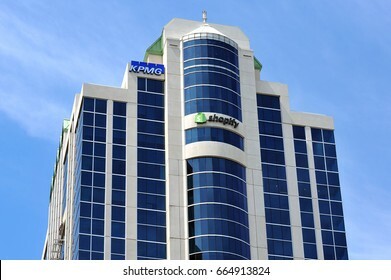 OTTAWA, CANADA - JUNE 11, 2017: High rise building at 150 Elgin Street which houses KPMG and the Headquarters of the successful software company Shopify. 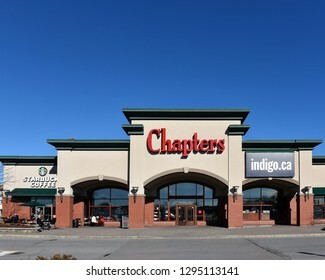 Kanata, Canada - Nov 4, 2018: Chapters big book, store on Terry Fox Dr, is a Canadian chain owned by Indigo Books and Music. 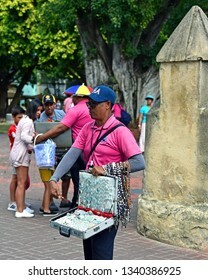 It was founded in 1995 and features coaches for customers and a Starbucks. 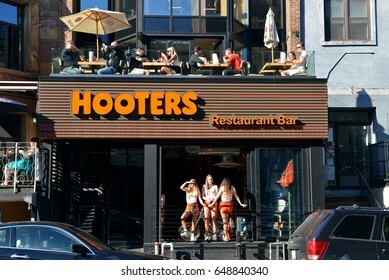 MONTREAL, CANADA - MAY 27, 2017: Hooters girls at the window of the restaurant on the trendy Crescent Street. 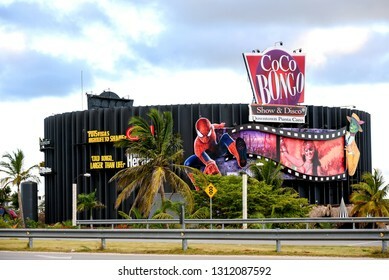 It is part of a US based casual dining chain that has locations in several countries. 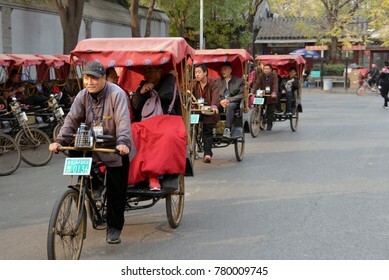 BEIJING, CHINA - NOVEMBER 9, 2017: Cycle rickshaw, or pedicab, riders transport passengers on Beijing street. 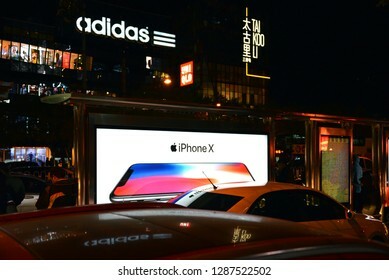 Beijing, China - November 11, 2017: Night shot in Sanlitun, a busy shopping district, featuring billboard ad for release if iPhone X. Adidas and Uniqlo signage is also visible. 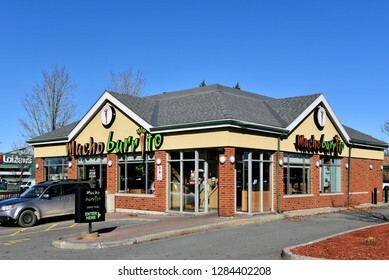 Kanata, Canada - November 4, 2018: Mucho Burrito, the Canadian chain of casual Mexican restaurants that was launched in 2006, on Terry Fox Drive in Ottawa suburb. 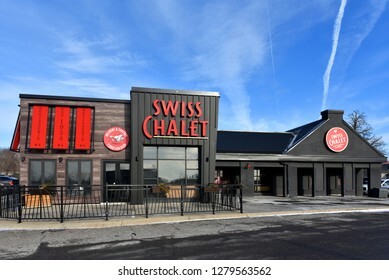 Kanata, Canada - December 29, 2019: Swiss Chalet, a popular casual dining chain, Terry Fox Drive. 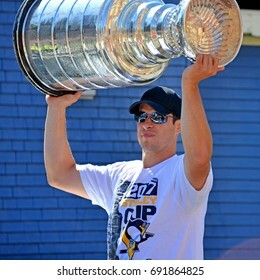 It was founded in 1954 in Toronto and now has over 200 locations in Canada. 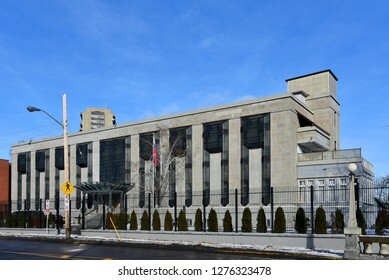 Ottawa, Canada - December 15, 2018: The Russian Embassy on Charlotte Street. 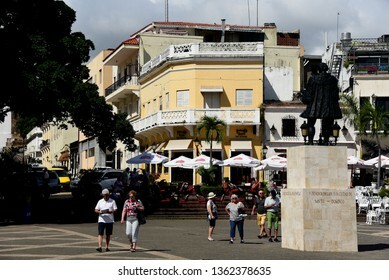 The site was given to the Soviet Union in 1942. 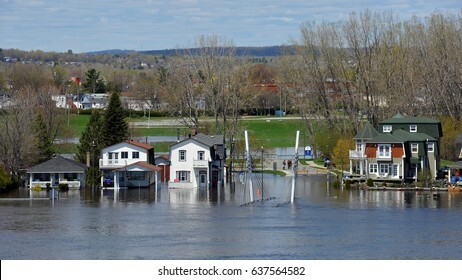 GATINEAU, CANADA - MAY 8, 2017: The severe flooding on the Quebec side of the swollen Ottawa River. 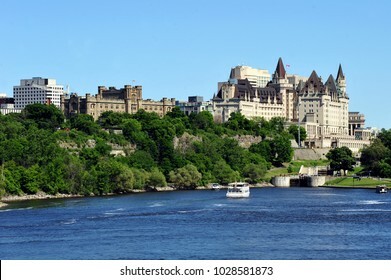 Pointe Gatineau is one of several areas in North America that has suffered flood conditions. 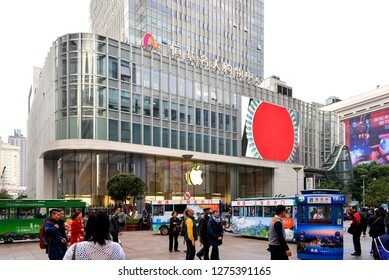 Shanghai, China - November 11, 2017: Apple store on Nanjing East Road, a busy shopping district that is pedestrian only for some blocks. 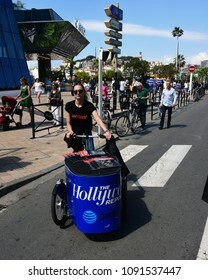 A small fun train that transports people along the street. 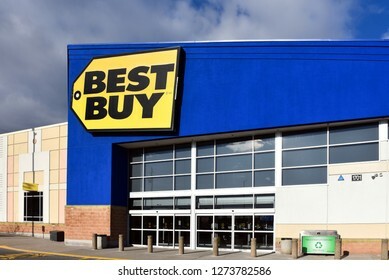 Ottawa, Canada - April 8, 2018: Best Buy, the US based multinational consumer electronics and technology retailer, store on Merivale Road. 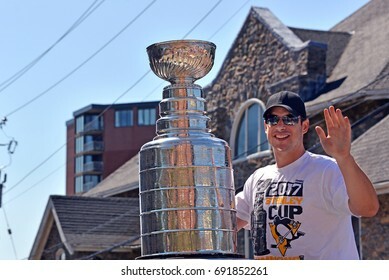 DARTMOUTH, CANADA - AUG 7, 2017: Cole Harbour native Sidney Crosby, captain of the of the Stanley Cup champion Pittsburgh Penguins with the Cup as the grand marshal for the 122nd Natal Day Parade. 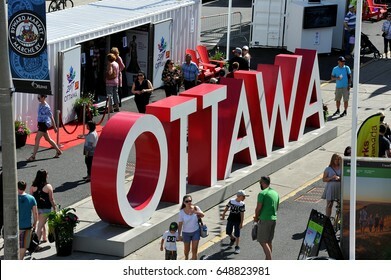 OTTAWA = MAY 28, 2017: The Ottawa sign installed at Inspiration Village, a temporary attraction with special exhibits and performing arts events built to help celebrate Canada's 150th anniversary. 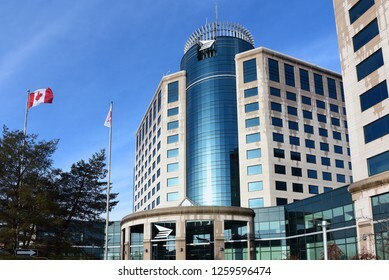 Ottawa, Canada - December, 15, 2018: The headquarters for Canada Post on Riverside Drive. 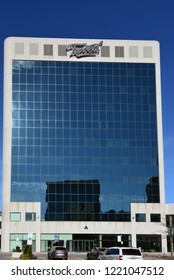 The Crown Corporation is the primary postal operator in the country. 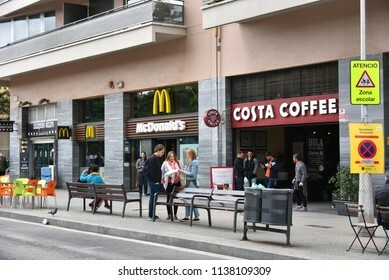 Barcelona, Spain - May 13, 2018: Costa Coffee, the British coffeehouse that is the second largest coffeehouse chain in the world, and a McDonalds across from the Sagrada Familia. 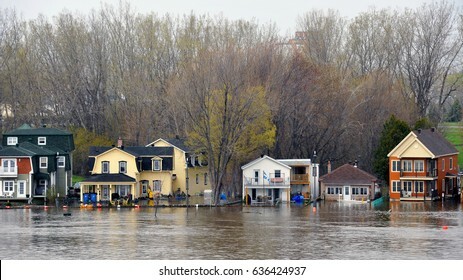 GATINEAU, CANADA - MAY 10, 2017: The severe flooding on Rue Jaques-Cartier on Quebec side of the swollen Ottawa River. 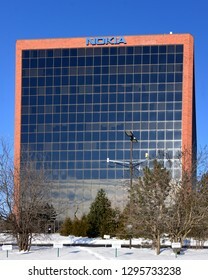 It is one of several areas in North America that has suffered flood conditions. 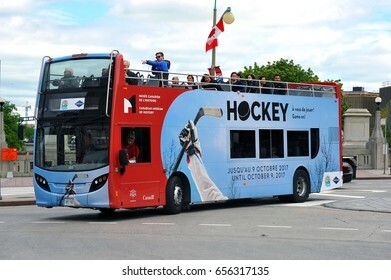 OTTAWA - JUN 3, 2017: Grayline tour bus showing tourists the downtown area is painted with ad for the Hockey exhibit at The Canadian Museum of History. 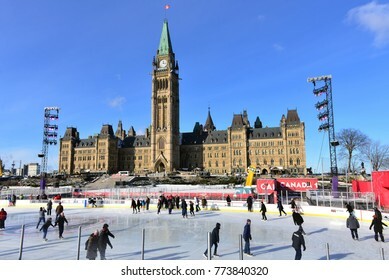 The Canadian capital attracts many tourists. 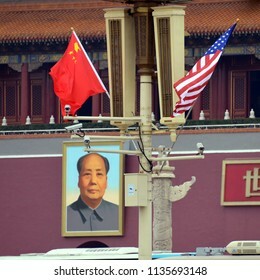 Beijing, China - November 9, 2017: US and Chinese flags are on display outside the Forbidden City are for the State Visit Plus of President Donald Trump. 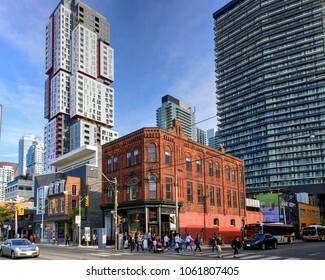 Toronto, Canada - September 16, 2016: The trendy Queen Street West near Peter St. including the Peter Pan Bistro and high rise condo apartment buildings. 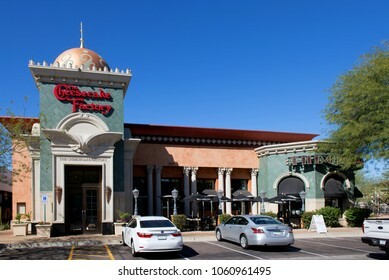 Scottsdale, AZ, USA - February 22, 2016: The Cheesecake Factory on N Scottsdale Rd. 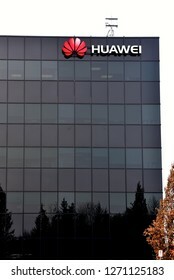 It is one of several locations operating in the US with its headquarters in California. 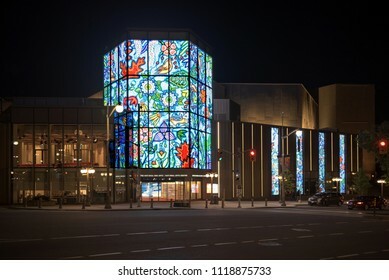 Ottawa, Canada - June 21, 2018: The National Arts Centre displays digital images of by Métis visual artist Christi Belcourt on its Kipnes Lantern, for National Indigenous Peoples Day. Massena, NY, USA - April 12, 2014: Walgreens, on Main Street, is the second largest pharmacy chain in the US. 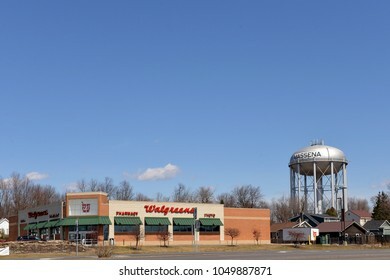 The village water tower is to the right. 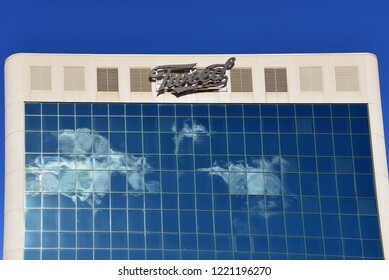 HOLLYWOOD, FL, USA - MAR 5, 2017: BJ's is a membership only Wholesale Club with over 200 locations mainly on the East Coast of the USA. 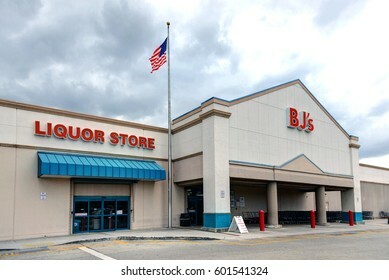 This location at Oakwood Plaza has an adjacent liquor store. 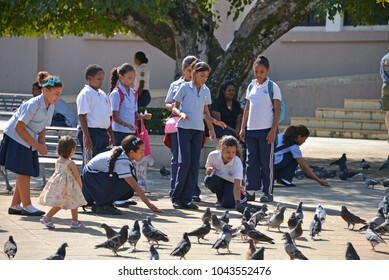 Puerto Plata, Dominican Republic - January 22, 2014: Dominican school children in uniform feed the plentiful pigeons in the Central Park in Puerto Plata. 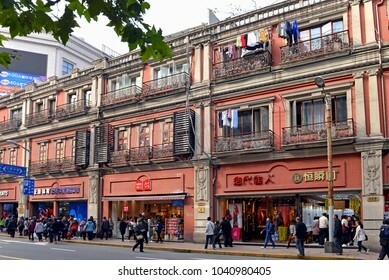 Shanghai, China - November 19, 2017: Traditional looking buildings above stores on the busy and trendy shopping area of Nanjing East Road including a Miniso store. 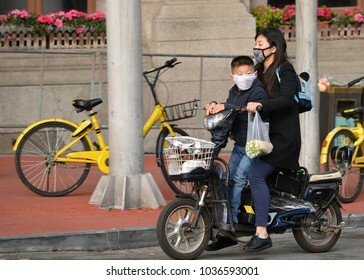 Shanghai, China - November 18, 2017: Chinese woman and boy, wearing masks, ride a motorized bike on the streets of Shanghai. 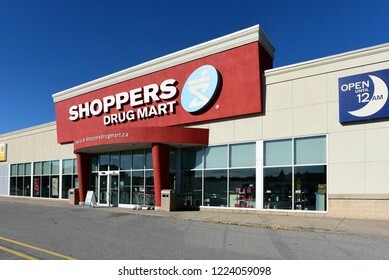 Ottawa, Canada - November 3, 2018: Shopper's Drug Mart in Kanata, a suburb of Ottawa. 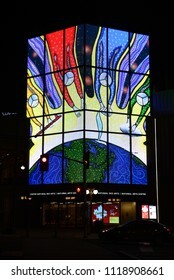 The Canadian pharmacy was founded in 1962 and now has over 1300 locations in Canada. 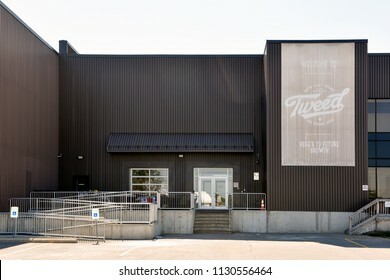 Kanata, Canada - November 4, 2018: Building with Tweed sign in Kanata, a suburb of Ottawa. 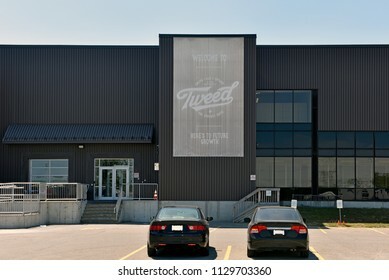 Tweed is a wholly owned subsidiary of the ever expanding Canopy Growth cannabis/medical marijuana company. 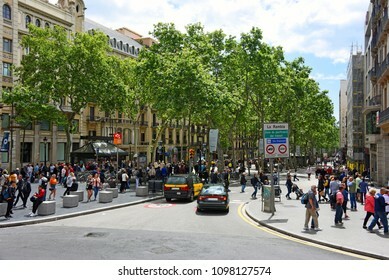 Barcelona, Spain - May 13, 2018: Entrance to La Rambla with signs for pacification of traffic and preference of bikes. 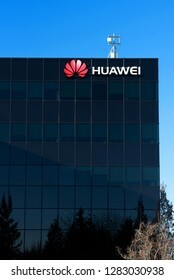 It is a popular tree-lined pedestrian mall stretching 1.2 km. 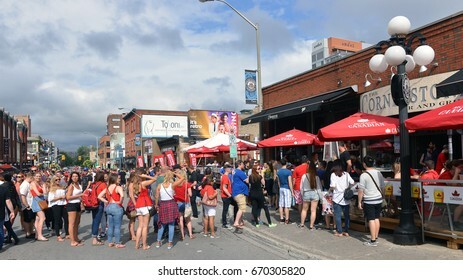 OTTAWA, JUL 1, 2017: People lineup to get into the Cornerstone Bar and Grill on Clarence St on Canada Day in the Byward Market. 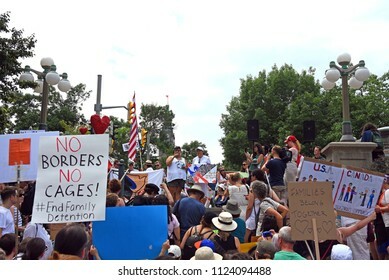 Crowds were larger due to this being the 150th anniversary. 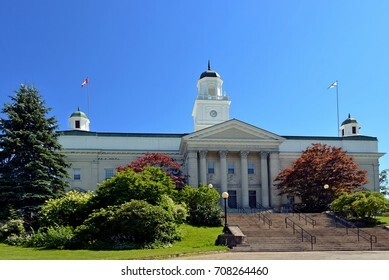 WOLFVILLE, NOVA SCOTIA - JUL 31, 2017: University Hall at Acadia University a renowned University that was founded in 1838. 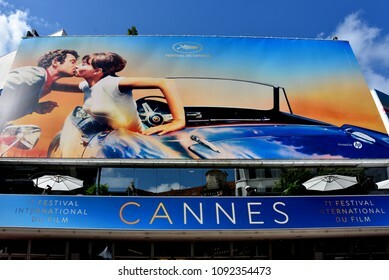 Cannes, France - May 11, 2018: An unidentified woman cycles a bike filled with Hollywood Reporter magazines to distribute to the crowd at the 71st Cannes Film Festival. 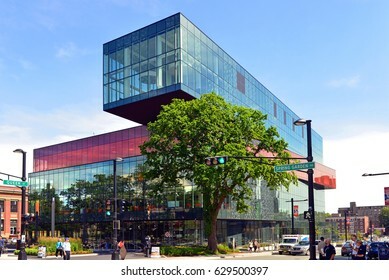 HALIFAX, CANADA - AUG 5, 2015: The award winning Halifax Central Library which opened to the public with great fanfare on December 13, 2014 on Spring Garden Road. 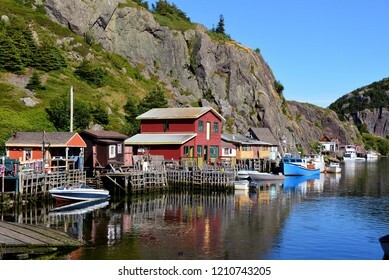 Quidi Vidi, St. John's, NL,Canada - August 11, 2018: The scenic neighborhood of Quidi Vidi which was once a historic fishing village located within the capital city of Newfoundland and Labrador. 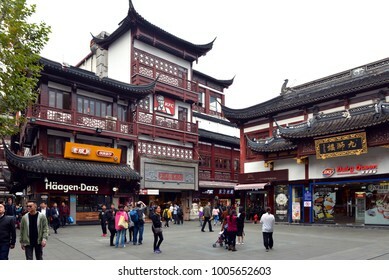 SHANGHAI, CHINA - NOVEMBER 2, 2017: The Shanghai Grand Theatre in People's Square of the Huangpu District. 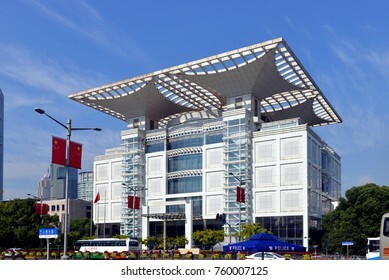 It opened in 1998 and is the home of the Shanghai Opera House performing company. 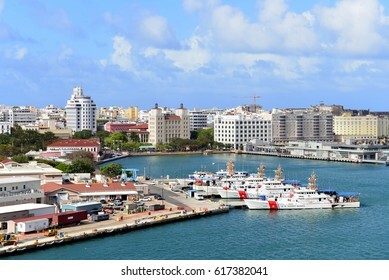 SAN JUAN, PUERTO RICO - FEB 28, 2017: The US Coast Guard Sector with ships in the foreground and the skyline of the city in the background on a sunny day. 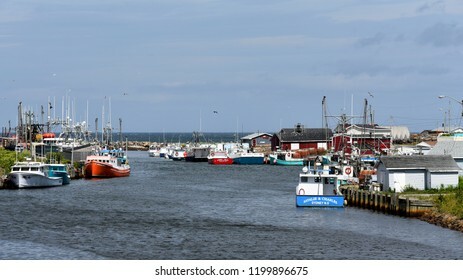 Glace Bay, NS, Canada - August 2, 2018: The picturesque harbour of Glace Bay, Cape Breton with many fishing boats. 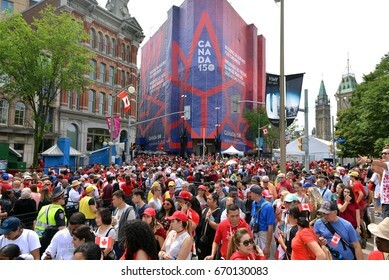 OTTAWA - JUL 1, 2017: Thousands of people lineup to go a fenced maze that leads to an intensive and time consuming security check to gain access to the Canada Day festivities on Parliament Hill. 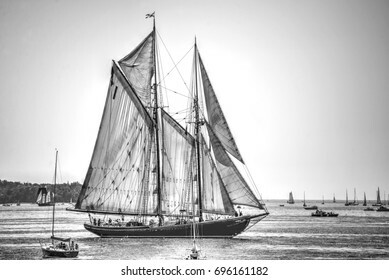 HALIFAX, CANADA - AUG 1, 2017: The iconic Bluenose II during the Tall Ships Parade of Sail in Halifax. The original fishing and racing schooner is featured on the Canadian dime. 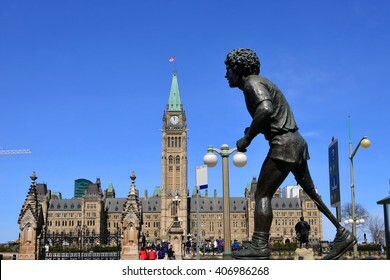 OTTAWA - APR 16, 2016: Statue of Terry Fox across street from Parliament Building in Ottawa. 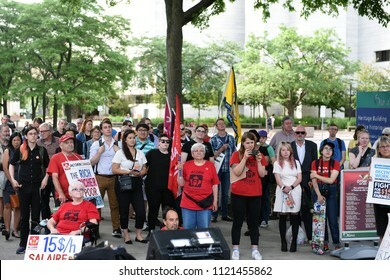 Fox is revered by Canadians for running a marathon a day on one leg to raise money for cancer research. 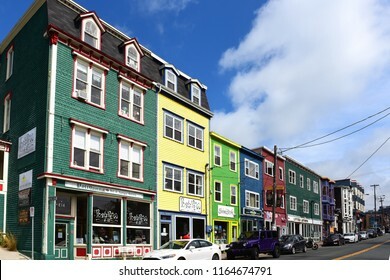 St. John's, NL, Canada - August 12, 2018: A row of colorful shops on Water Street. 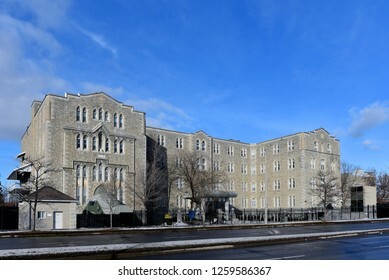 St. John's is the oldest city in North America, and many of the buildings are appreciated for their history. 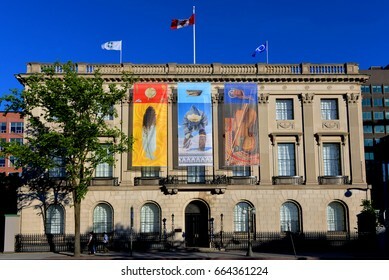 OTTAWA - JUN 21, 2017: Native themed banners are added to the new Centre for Indigenous people during a ceremony on National Indigenous Peoples Day, formerly known as National Aboriginal Day.